Among the numerous complaints voiced over the proliferation of commemorative coins during the 1930s, one of the most frequent was that these issues celebrated events of purely local significance. 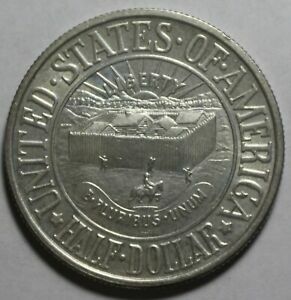 These themes were judged inappropriate for a United States coin, yet having the proper connections in Washington was often all that was needed to see one's pet project through to fruition. 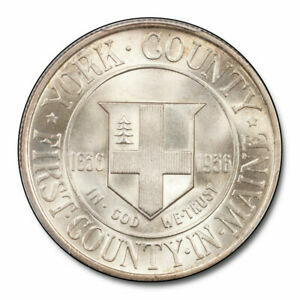 Such a coin was the half dollar commemorating the 300th anniversary of York County, the first county in Maine. 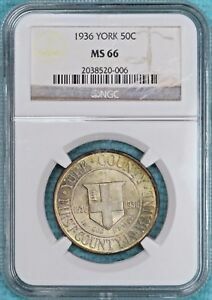 Though decried at the time of its issue, this type has since been honored among the ranks of its fellow commemorative coins from that prolific decade of the 1930s. York County was established in 1636 as the southernmost portion of what soon thereafter became known as the Province of Maine. It centered around the town of Saco, which itself was formed around a wooden stockade known as Brown's Garrison. The town of Saco had been founded in 1631, and with the establishment of York County, it then became the county seat. The land encompassed by York County was just part of the region owned by San Ferdinando Gorges. In 1643, Gorges' title to the land was challenged by George Cleve. Taking advantage of the chaos in England prompted by the Mother Country's ongoing Civil War, Cleve claimed that York County was his by a land grant bestowed on him in 1630. Though this claim was largely unsupportable, Cleve won his case through the influence of friends in Parliament, including the Earl of Warwick, who had originally made the grant. Cleve's province bore the peculiar name of Lygonia, and thus Maine remained until Gorges' death in 1647. Seizing this opportunity, Massachusetts then proclaimed that his lands were now under its administration. The holdings of Cleve were similarly absorbed without due process, and by 1658 all of Lygonia was part of Massachusetts. Appeals from the heirs of both Gorges and Cleve brought no justice, since England was now a Commonwealth under Puritan control. As Massachusetts was a bastion of Puritan power in the New World, it was deemed by Parliament the party most worthy to rule this land. Massachusetts renamed the former York County to the County of Yorkshire, also rechristening Georges' capital of Gorgeana as York. The fall of the English Puritans in 1660 and the Restoration of King Charles II to the throne prompted widespread reappraisals of all actions taken by Parliament during the Commonwealth years. In 1677, the name of Maine was restored to the region, bringing full circle the 1639 decree of the king's father, Charles I, that this land was to be known "not by any other name or names whatsoever." 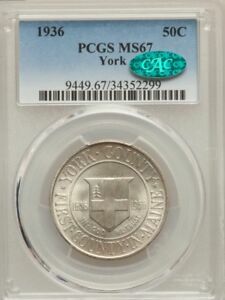 The issuing of a commemorative coin to mark the 300th anniversary of York County probably had more to do with the fact that one of its key sponsors was a numismatist than it did with the significance of the event itself. Walter P. Nichols was Treasurer of the Committee for Commemoration of the Founding of York County. He was also a summertime resident of the area and an avid collector of commemorative coins. The committee selected Walter H. Rich of Portland, Maine to design its proposed half dollar. 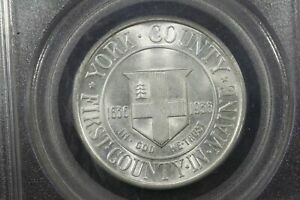 For the obverse Rich employed simplicity in depicting the Seal of York County. He based the coin's reverse on a perspective view of Brown's Garrison that had appeared in The Proprietors of Saco. 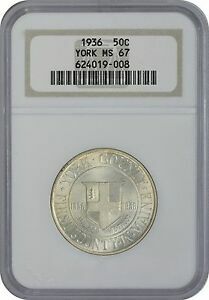 Despite numerous similar bills honoring events of purely local interest, legislation authorizing the York Half Dollar was passed June 26, 1936. 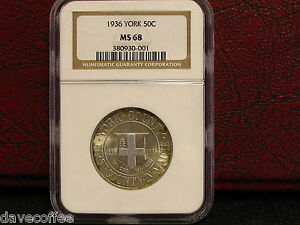 It provided for not more than 30,000 coins, these to be produced with a single date and at a single mint. 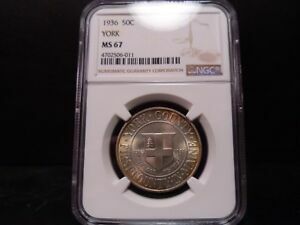 This occurred at the very height of the speculative market in commemorative coins, and the rush was on to get the York issue to collectors. The Federal Commission of Fine Arts, perhaps overwhelmed by so many new coin designs, cooperated by approving the designs on July 17 with only minor corrections to be made. In an unusual turn, Rich's drawings were sculpted directly in bronze, bypassing the usual plaster transfers. This may account for the coin's uncharacteristically flat relief. The work was performed by the G. S. Pacetti Company of Boston, and the dies were reduced from these bronze models by New York City's Medallic Art Company, an arrangement preferred by the overworked Philadelphia Mint. 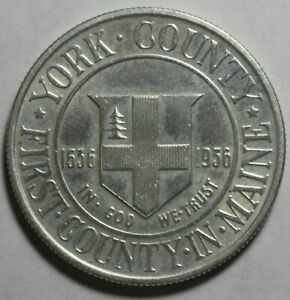 As issued, the York Half Dollar features on its obverse the arms of York County. This includes a red cross against a white shield, with a pine tree in the upper left quadrant. The dates 1636 and 1936 flank the shield, while the statutory motto IN•GOD WE•TRUST appears below it, all enclosed within a circle. Arranged around the obverse periphery are the legends YORK•COUNTY and FIRST•COUNTY•IN• MAINE, separated by stars. The reverse of this type features a view of Brown's Garrison with a rising sun behind it. The statutory mottoes LIBERTY and E•PLURIBUS•UNUM appear in the field above and below the garrison, respectively. Below the Latin motto are the designer's script initials W.H.R. All of these elements are enclosed within a circle. 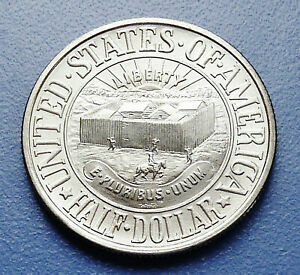 Arranged around the periphery are the legends UNITED•STATES•OF•AMERICA and HALF•DOLLAR, the two separated by stars. An issue of 10,000 coins was planned, with that many being reserved for residents of Maine. This figure was reportedly oversubscribed, and a total of 25,015 York Half Dollars were actually coined during August of 1936 (the odd 15 pieces were reserved for assay and later destroyed). 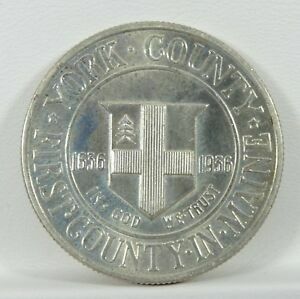 Offered at $1.50 apiece to locals and at $1.65 postpaid to those out-of-state, official distribution of the York Halves was handled by the York County Tercentenary Commemorative Coin Commission of Saco, Maine. Initially, sales were brisk. The collapse of the commemorative coin market in late 1936 and 1937, however, caught the commission with about 6,500 pieces remaining. 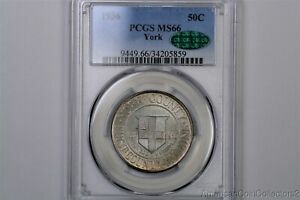 While many such sponsoring groups returned their unsold coins to the mint for destruction, the York people held onto theirs for more than 20 years following the tercentenary. These were offered in lots of 10 for $15.50 during the late 1950s and were quickly sold. This left a net mintage of 25,000 pieces. 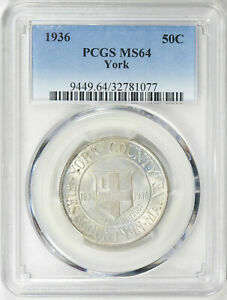 York Half Dollars typically display satiny luster, this ranging from dull to blazing. Due to their very low relief, virtually all examples are well struck. The area most susceptible to contact marks is the shield, though marks and abrasions on the garrison can also be distracting. 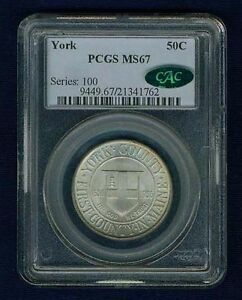 Circulated examples of this type are rare, as most were kept as souvenirs or were purchased directly by coin collectors. Numismatically mishandled specimens can be a problem, and these may show signs of cleaning and/or abrasive wiping. Gems of the York are fairly plentiful. 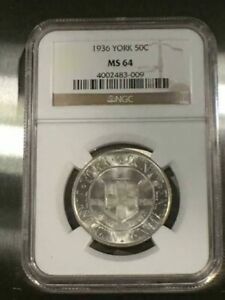 Coins of this type were originally issued in folding paper holders which depict on their front cover black line drawings of Brown's Garrison and the York National Bank of Saco, which in 1936 stood on the site on the former stockade. A chatty history of the bank appears on the inside front cover, while the inside back cover provides slots to hold up to five coins. The back of the holder is blank. 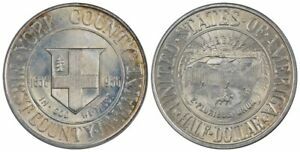 To further protect the coins from abrasion, a tissue paper insert was included with the inscription: "We thank you for your interest in our commemorative half dollar, and extend to you the hospitality of York County, Maine. 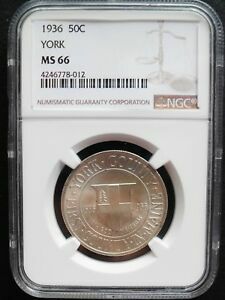 York County Commemorative Coin Commission." The folder was then placed within a mailing envelope bearing the commission's name and a return address of the York National Bank. 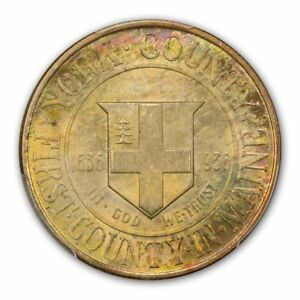 The first 100 pieces minted were inserted into maps depicting "Olde York County Maine." Each map was then given a number corresponding to the order in which its particular coin was struck and mounted under glass for presentation. These coins bore no special finish or treatment, and there is no evidence of any proofs being struck.